Beauteous 2016 Blogger Template by Yo..!Templates is a one of Free Blogger Templates created for Fashion, Travel, Lifestyle and Food bloggers. Designed with readability in mind, Beauteous highlights what’s important – your content. Its efficient use of space, clean lines and excellent typography make your blog a pleasure to read and browse. We believe that a blog theme, should feel fluid, light, and intuitive. that’s what we are aiming, using clean code and detailed designs. Yo..! 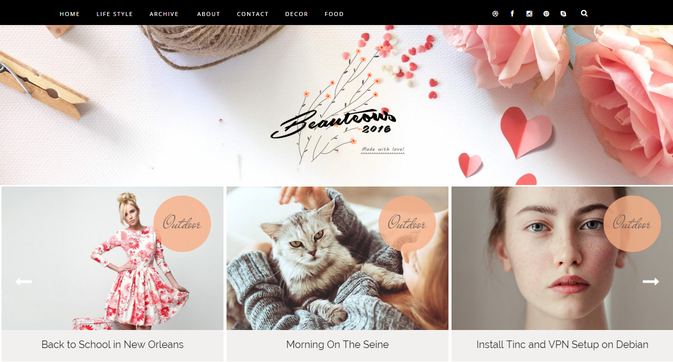 Templates presents to you "Beauteous 2016" our most elegant Blogger templates of 2016. This Blog theme has a fully responsive blogger template layout, that adopts any screen size quickly and effieciently, that help this template to look equally good on any device. Sticky Menu Bar gets displayed when you scroll up. Template Installation Service: If you are not that tech savvy and don’t have much experience with HTML/CSS Or Don't want to mess with it, then you can opt our Blogger Template Installation Services package that will cost you $20, A good price for hassle free Installation process. Our Tech-Team will handle it and make your blog/site exactly like the demos. To buy this service click here. Note : This service does not include adding new features. Your blog template will be available instantly Once Your Payment Process Is Completed.You will receive an email from Yo..! Templates with your download link. Your template will download as a zip file, you must unzip the file using winzip or winrar then follow the installation instructions inside the template folder. And Last But Not The Least, Our Premium Customer Support Service. If you are using free version of this template please do not remove/Alter the credit link given in the bottom of the template as it will redirect your site to our site. For those who want to remove footer credit links can buy Full Version of this template. If you are facing any problem while installation or at any stage, please feel free to ask for the assistance through our comment system or through the contact form. Premium Version buyers will get advance and lifetime support guarantee,as well as all the latest updates. Hello, is bad for Russian-speaking blog. Cyrillic is not provided. How to change the font? thank you! And still does not show popular posts - no pictures at all! inside the first level of files is documentation.html - it will lead you to the instructions to install and clicking over to the 'widgets content' tab shows everything else but not the Facebook page box, they're missing. I wanna know how the Facebook page box was sourced. It's missing from the widget content. I can not find .xml? Hi, is possible in premium version to change color of this round labels? Hi! How can I put Carousel mode on? can we stop the photos from auto enlarging? My smaller photos look terribly pixelated. Can I also have more control over over where the READ MORE in my posts starts like I would in my regular blog. The auto photo and text sizing is really throwing off my the look of my blog. 1) Does purchase include carousel and slider feature? 2) Can the fonts and font colors be changed? 3) Are there more social media buttons with purchase? 4) Once purchased, is there a way to remove the pictures added at the bottom of each post? Thank You for showing your interest towards this template, we are glad to know that you liked you work. yes you can change the colors, fonts, size, social media buttons as per your requirements, our customer support team will help you out to that, or you can also go for the premium version with installation package, where our professionals will personally setup your blog just like the demo version, this will cost you $20 USD. I really really love it, but I’m with two problems. First blog followers box does not work in the sidebar, but if I put in the footer, the photos of followers already appears. The problem is that I don’t like to see this in the footer, I prefer the sidebar. How can I fix this? The second problem is about the images I put in the posts. They are increased. For example, when I write the post I choose the medium size, then saved and then when I’m going to read the post in my blog, I see the images in large size. If I change to the small size, the images stay exactly the same. Can you help me with this 2 problems? Hi, I'm having the same issue as you. Can you please tell me how you solved the problem. Thanks! i like this template so much but i have not English blog. anyone can help me to change "Read more" for my language? Hi! I managed to resolve the problem I posted yesterday. My concern now is I wanted to try the one with the slider but the slider isn't working. Can you help me? Give me instructions? Please check your E-mail Inbox, We have send you the instructions to resolve this issue. I just purchased a blog template but it still includes the footer credits and encrypted scripts. Would you be able to send me a new link omitting this. Hello! I've downloaded the Carousel version, but how can I get the Slider version instead?? I can't find the download for it. Thanks so much. Your templates are really great! First off all, thanks for the wonderful template! I luv it! But my problem is about the images I put in the posts. They are increased and is showing all the images of the post on top in large size. I really want that the image appering was just the first image. Can you help me? Google wants to see one specific file on your website. This one file is an XML Sitemap. Some of us have sitemaps on our website. If we want to get a look at all the files and pages on a website you use the sitemap. But those are usually HTML sitemaps. Hi. How i can change the top bar (Home / Life Style / Archive / About / Contact / Decor / Food)? Hi! I've installed this amazing template but I'm having an issue: the 'join this blog' widget isn't showing. How can I fix it? But there was no change. I wanted to ask if this / a> is not closed. Thank you. I'm having a problem to get the carousel to work. I did as instructed. I put a label on a few blog post and i put that label into the widget. But the carousel did not show up. Please help me to resolve this issue. Thanks! Please make sure that you have entered the label name exactly same as given in the posts( case sensitively), Also check your blog permission should be set as public. ahh i c. So it will only work if it's set to public? Right now it's private because I'm still setting the blog up. Hi, thanks so much for your help in my previous issue. I managed to resolve it. I have another question which I hope someone can help me with. For the background image at the top of the page, the size of the image does not change when the browser width is being adjusted. Is there a way to make that background image changes it's size as we adjust the browser width? I managed to increase the header margin to show more of the background image. Is there a way to make the background image changed as the browser width is being adjusted? if yes then i might be able to use the background image like a cover photo. Hello, I removed Slide1 by accident. Are there has a way to recover and also i want to change the NEWSLETTER text in another language and the READ MORE button too. Hi, I bought and installed this template but even after putting Labels as instructed, the carousel/slider is still missing in my blog! Can you please help me with this. I purchased the Beauteous Blogger Template with the slider yet the slider is not included. Can someone please let me know how to get the slider or how to fix the problem. Can someone help me? Why can't I comment on the first post of the site? purchased the template but can't finde the xml-file! Looks like it is missing....Can you help me please? Hello. How do I halve photos in the post? They are huge and they look bad. Thanks for the help! Hello. I in my blog standardized all the photos in 750x450 pixels. I used a Fireworks editor, but you can use any other editor. So the photos are in a unique size. are the files in this template supported on MAC computers? Copyright © Yo..!Templates | Blogger Templates | Made with by Indians.